What a difference a year makes! Last year at about this time, Minnesota was preparing to vote on an amendment that would constitutionalize marriage as between one man and one woman, excluding many of our population from the rights and benefits legal marriage carries with it. 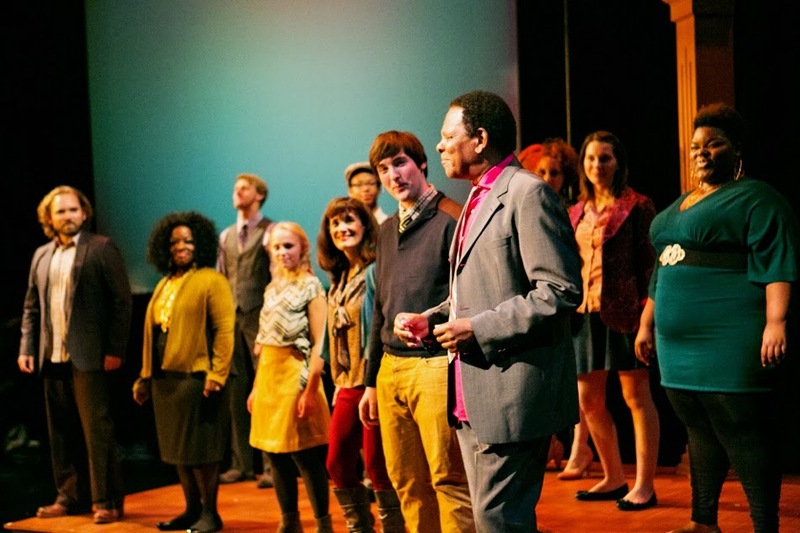 Illusion Theater participated in this debate by presenting a charming musical review show, created by Roberta Carlson and Michael Robins, that featured interviews with real-life couples. One year later, the amendment in question has been voted down by the people of Minnesota, and earlier this year our governor Mark Dayton signed marriage equality into law. Illusion is responding to this new development by presenting a sequel: Love & Marriage: What A Difference A Year Makes! It's similar to last year's show, but with some cast changes, many new songs, and a few follow-up interviews with the couples. As charming and entertaining as last year, but with a decidedly more celebratory air because, as they sing, "love is the law!" While the music and the singers are fantastic, at the heart of this show are the interviews with many different couples - old and young, gay and straight, new love and established love, famous (to a MN theater geek like me) and not. They talk about all phases of a relationship, interspersed with songs from the cast that reflect the sentiment. From exciting new love ("Every Little Thing He Does," "How Will I Know") to to break-ups ("Rolling in the Deep," "Somebody I Used to Know") and everything in between. Performing these songs are six professional singer/actors and five talented young people who fill out the chorus and have a few star moments of their own. The professional cast includes an exuberant Neal Beckman, Teri Parker-Brown (singing a beautiful version of one of my favorite songs "I Can't Make You Love Me"), the powerful-voiced Rachel Hurst (with, I assume, her daughter Kennadi, proving that the apple doesn't fall far from the tree), the adorable Aeysha Kinnunen (a scene stealer as Lydia in Pride and Prejudice at the Guthrie this summer), Randy Schmeling (a voice I always love to hear), and the super-smooth Dennis Spears. 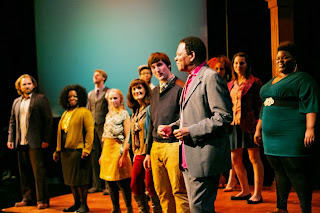 Gary Q. Lewis has choreographed some simple dance moves that enhance the performance. 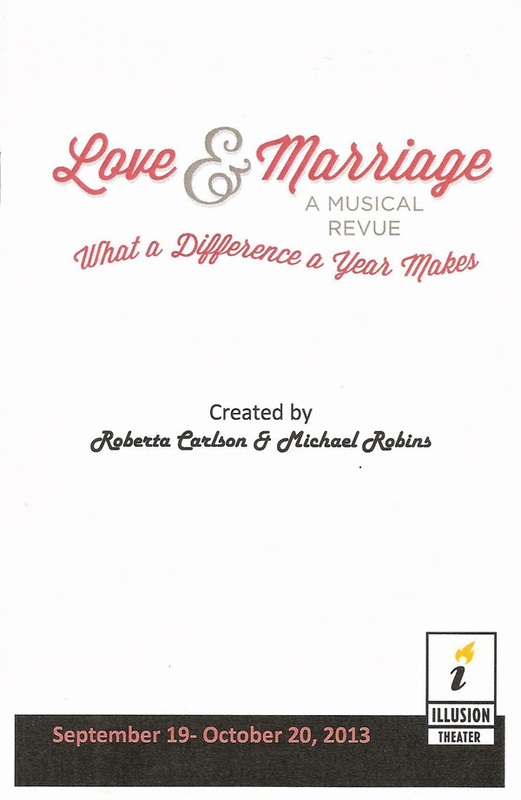 Love & Marriage: What A Difference A Year Makes continues at the Illusion Theater through October 20. It deserves a bigger audience than the one that was there the Thursday night I attended, because it's a fun, charming, touching, beautiful look at the many different kinds of couples and relationships, who are really the same when you get right down to the important things. Not at all preachy, just sweet and funny and real.